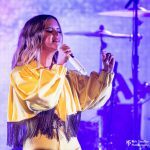 Grammy-nominated country artist Maren Morris recently headlined at the Showbox SoDo. The show was near the beginning of her 7-month long GIRL: The World Tour, in support of her second studio album, Girl, released last month. Cassadee Pope – 2012 The Voice winner – opened.